The yellow, fibrous roots of astragalus are typically harvested after four years of plant growth. The sliced root adds a sweet, mildly earthy flavor to soups and teas (but remove the pieces before consuming like you would bay leaf). active compounds Numerous Saponins, Including Astragaloside, flavonoids, Polysaccharides, Minerals, Amino acids, Coumarins, Triterpene glycosides, Asparagine, Calycosin, Formononetin, Kumatakenin, Sterols. appearance & aroma Astragalus root has a woody appearance and smells a bit like freshly cut grass. good vs bad Properly stored, the dried root will keep for 3 years. culinary Add 2 or 3 pieces to simmering vegetable stocks, soups or stews (remove before eating). aromatic Some people claim that the scent of dried astragalus root has a calming effect. wellness Use in teas, infusions and tonics. Astragalus root may also be tinctured. safety Consult a health care practitioner before using this herb if you take other medicines because astragalus is known to increase the effects of some agents or reduce the absorption of others. 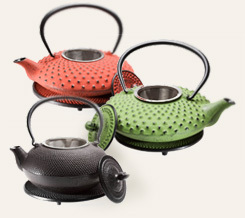 Cast Iron Teapot with Matching Trivet also comes with a stainless steel mesh infuser to hold loose tea, bark and root slices. 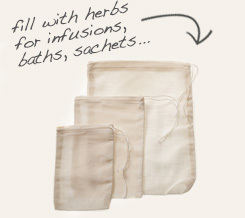 100% cotton muslin bags hold large pieces for easier brewing and infusing. 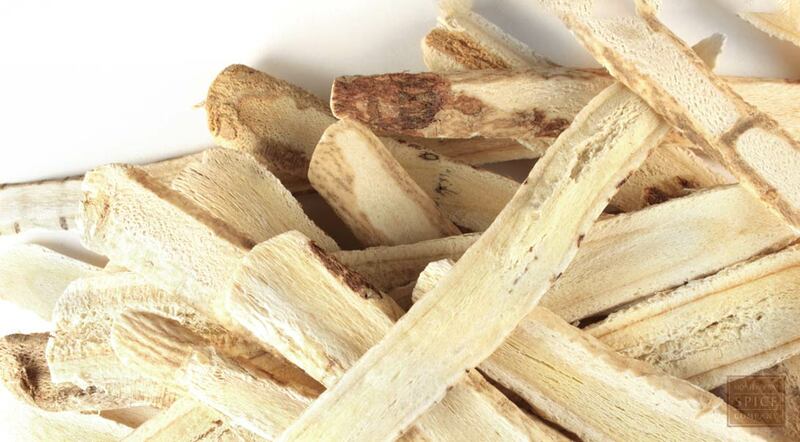 Astragalus root has a mild, pleasant flavor often described as earthy. In cooking, it pairs well with most beans and vegetables, especially mushrooms and carrots. In China, astragalus root is known as Huang Qi and is one of the “50 fundamental herbs” that are central to ancient Chinese healing formulas. In fact, five of the best known preparations formulated to enhance vital life energy include astragalus root. Chinese herbal formulas largely consist of tonics, which may incorporate several botanicals. Carefully blended according to ancient wisdom, tonics are intended to promote a balance of the physiological and psychological aspects of the body’s systems and organs as opposed to suppressing one or more symptoms. Astragalus is a component of such tonics because of its association with promoting longevity and good health. Background: Used in China for centuries according to records over 200 years old. Its Chinese name, Huang Qi, means "yellow leader" because of the yellow hue of the root. Description: Grown in China in sandy soil and lots of sunlight, its roots are collected after growing for four to seven years and dried when they're harvested in the spring. There are more than 2,000 types worldwide. Extract: Root is made into a liquid herbal extract by boiling the root and brewing into a tea. Root: Sliced up, it can be added to liquid meals such as soups or chewed on like licorice. Safety: Do not use Astragalus if you suffer from skin disorders.